The world of food storing and packaging have been a complete new dimension with vacuum sealing. With the advent of technology, there have been different vacuum sealers which are now available in the market. There are different vacuum sealers which are bulky in size. Some people look for sealers which are small in size. That is when Oliso Frisper PRO-1000 Vacuum Sealer comes into prominence. A first look into the Frisper PRO-1000 and one will get the impression of sheer sophistication. In line with the effectiveness that modern day vacuum sealers provides it takes more than just a set of basic features to impress upon the consumers. The Frisper PRO-1000 does a good job of impressing the consumer- not by virtue of a new feature, but by virtue of a new patented technology itself. This sealer is very easy to use and usually comes with a particular starter kit with several bags of different sizes. You will also get bags for different pantry items which are not just for freezer and refrigerator. Some of the products which you can seal usually include berries, fresh herbs for stews and soups, meat, nuts, cheeses as well as leftovers. Automatic Control: The sealer ensures automatic control the whole operation is hands-free with just an insertion of bag to begin vacuuming. Compact design: The sealer is compact in design which is why it can be placed on countertop and is easy to use. Air tight seal: The seal present here is air tight which keeps the foods fresh longer. Powerful performance: This sealer is one of the powerful one and is a professional one. Start button: To begin the process of vacuuming as well as sealing, there is the automatic feature. One just has to press the start button. Stop Vacuum: If you are sealing any sort of fragile and delicate items then you can use the cancel button any time to stop the process. Food type: You can use the dry option for dry foods and the moist option for soggy and damp foods. Punch and Seal system: You do not need a bag cutter for this. Simply need to insert and seal. Light Indicators: The lights are up when the sealer is in use. Thus it keeps the user informed about the whole process. Airtight Gaskets: This ensures that the bag is held in place against the strip used for sealing. These gaskets are non porous which is why there is less chance of food getting tainted. Drip Tray: To catch the liquids which are spilling, there is this drip tray. This machine is a little larger than one’s hand which makes it easy to store it in drawer and cabinet. It is also light-weight less than a pound which is why it can be carried from one place to another. The bags provided can be effectively reused for nearly 10 times. Each bag has a number and you can simply place it on the machine with an arrow. After using the bag, clean the bag out with proper soapy water and let it to dry. This bag can be used again and again. There is easier control in this sealer as delicate food items would not be crushed and you do have the authority to stop the vacuum at any point of time. This sealer with all the necessary accessories and the kit is available at any departmental store. The sealer is easy to operate and there is a set of manual instruction provided which makes it easier to operate. The sealer keeps the food fresh for a longer time and seals things air tight. The only disadvantage the sealer has is that it can become less effective with the passage of time. Two words that will best describe the Frisper PRO-1000 Vacuum Sealer from Oliso and those are, “Must Purchase”. The value for money that the neat little vacuum sealer provides is quite unparalleled by any standards and the common consumer might just be left pleasantly surprised by the gamut of intelligent features that the vacuum sealer offers. 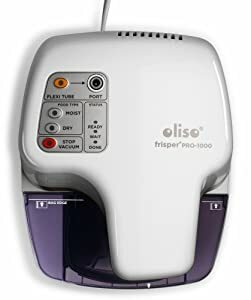 So it can be concluded that if you are looking for a portable and yet effective vacuum sealer then undoubtedly your best possible choice is Frisper PRO-1000.